Launch an Amazon EC2 instance with an AWS Identity and Access Management (IAM) role, an Amazon Elastic Block Store (Amazon EBS) volume, and tags that Amazon EC2 Systems Manager (Systems Manager) and Amazon Inspector use. 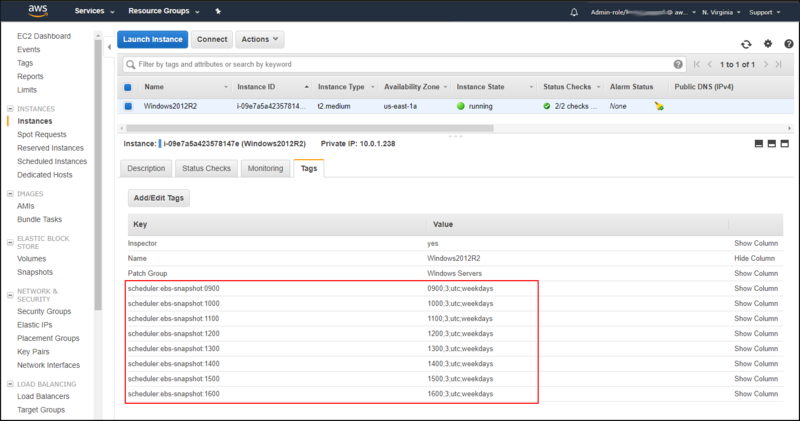 Configure Systems Manager to install the Amazon Inspector agent and patch your EC2 instances. Take Amazon EBS snapshots using Amazon EBS Snapshot Scheduler to automate snapshots based on instance tags. Use Amazon Inspector to check if your EC2 instances running Microsoft Windows contain any common vulnerabilities and exposures (CVEs). To catch up on Steps 1 and 2, see yesterday’s blog post. Determine the schedule for EBS Snapshot Scheduler by providing you with best practices. Deploy EBS Snapshot Scheduler by using AWS CloudFormation. Tag your EC2 instances so that EBS Snapshot Scheduler backs up your instances when you want them backed up. In addition to making sure your EC2 instances have all the available operating system patches applied on a regular schedule, you should take snapshots of the EBS storage volumes attached to your EC2 instances. Taking regular snapshots allows you to restore your data to a previous state quickly and cost effectively. With Amazon EBS snapshots, you pay only for the actual data you store, and snapshots save only the data that has changed since the previous snapshot, which minimizes your cost. You will use EBS Snapshot Scheduler to make regular snapshots of your EC2 instance. EBS Snapshot Scheduler takes advantage of other AWS services including CloudFormation, Amazon DynamoDB, and AWS Lambda to make backing up your EBS volumes simple. As a best practice, you should back up your data frequently during the hours when your data changes the most. This reduces the amount of data you lose if you have to restore from a snapshot. For the purposes of this blog post, the data for my instances changes the most between the business hours of 9:00 A.M. to 5:00 P.M. Pacific Time. During these hours, I will make snapshots hourly to minimize data loss. In addition to backing up frequently, another best practice is to establish a strategy for retention. This will vary based on how you need to use the snapshots. If you have compliance requirements to be able to restore for auditing, your needs may be different than if you are able to detect data corruption within three hours and simply need to restore to something that limits data loss to five hours. EBS Snapshot Scheduler enables you to specify the retention period for your snapshots. For this post, I only need to keep snapshots for recent business days. To account for weekends, I will set my retention period to three days, which is down from the default of 15 days when deploying EBS Snapshot Scheduler. Navigate to the EBS Snapshot Scheduler deployment page and choose Launch Solution. This takes you to the CloudFormation console in your account. The Specify an Amazon S3 template URL option is already selected and prefilled. Choose Next on the Select Template page. On the Specify Details page, retain all default parameters except for AutoSnapshotDeletion. Set AutoSnapshotDeletion to Yes to ensure that old snapshots are periodically deleted. The default retention period is 15 days (you will specify a shorter value on your instance in the next subsection). Choose Next twice to move to the Review step, and start deployment by choosing the I acknowledge that AWS CloudFormation might create IAM resources check box and then choosing Create. <snapshot time> – Time in 24-hour format with no colon. <retention days> – The number of days (a positive integer) to retain the snapshot before deletion, if set to automatically delete snapshots. <time zone> – The time zone of the times specified in <snapshot time>. <active day(s)> – all, weekdays, or mon, tue, wed, thu, fri, sat, and/or sun. Because you want hourly backups on weekdays between 9:00 A.M. and 5:00 P.M. Pacific Time, you need to configure eight tags—one for each hour of the day. You will add the eight tags shown in the following table to your EC2 instance. Navigate to your EC2 instance in the EC2 console and choose Tags in the navigation pane. Choose Add/Edit Tags and then choose Create Tag to add all the tags specified in the preceding table. Confirm you have added the tags by choosing Save. After adding these tags, navigate to your EC2 instance in the EC2 console. Your EC2 instance should look similar to the following screenshot. After waiting a couple of hours, you can see snapshots beginning to populate on the Snapshots page of the EC2 console. To check if EBS Snapshot Scheduler is active, you can check the CloudWatch rule that runs the Lambda function. If the clock icon shown in the following screenshot is green, the scheduler is active. If the clock icon is gray, the rule is disabled and does not run. You can enable or disable the rule by selecting it, choosing Actions, and choosing Enable or Disable. This also allows you to temporarily disable EBS Snapshot Scheduler. You can also monitor when EBS Snapshot Scheduler has run by choosing the name of the CloudWatch rule as shown in the previous screenshot and choosing Show metrics for the rule. If you want to restore and attach an EBS volume, see Restoring an Amazon EBS Volume from a Snapshot and Attaching an Amazon EBS Volume to an Instance. Install the Amazon Inspector agent by using EC2 Run Command. Set up notifications using Amazon SNS to notify you of any findings. Define an Amazon Inspector target and template to define what assessment to perform on your EC2 instance. Schedule Amazon Inspector assessment runs to assess your EC2 instance on a regular interval. In this post, I’m focused on how to make sure you keep your EC2 instances patched, backed up, and inspected for common vulnerabilities and exposures (CVEs). As a result, I will focus on how to use the CVE rules package and use your instance tags to identify the instances on which to run the CVE rules. If your EC2 instance is fully patched using Systems Manager, as described earlier, you should not have any findings with the CVE rules package. Regardless, as a best practice I recommend that you use Amazon Inspector as an additional layer for identifying any unexpected failures. This involves using Amazon CloudWatch to set up weekly Amazon Inspector scans, and configuring Amazon Inspector to notify you of any findings through SNS topics. By acting on the notifications you receive, you can respond quickly to any CVEs on any of your EC2 instances to help ensure that malware using known CVEs does not affect your EC2 instances. In a previous blog post, Eric Fitzgerald showed how to remediate Amazon Inspector security findings automatically. 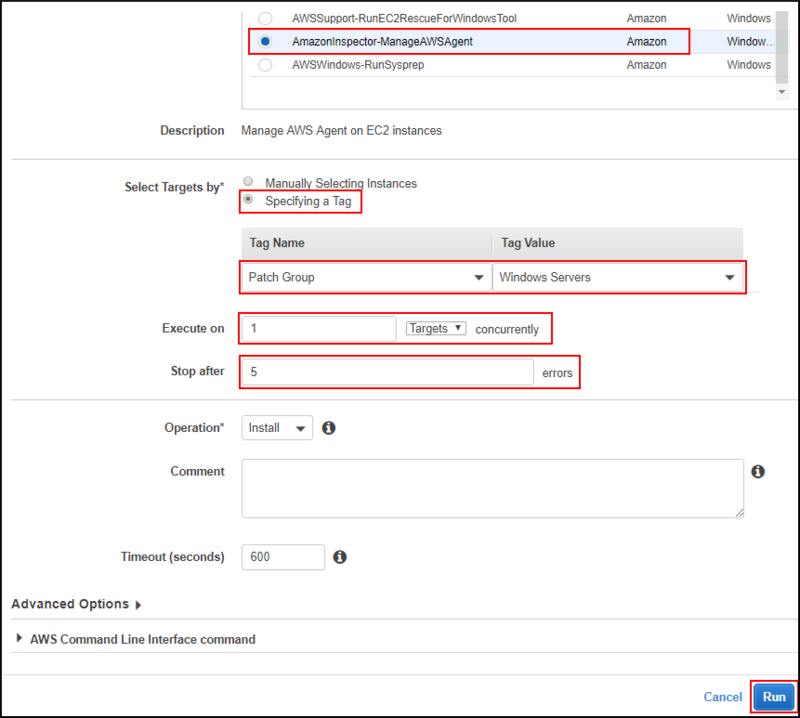 To install the Amazon Inspector agent, you will use EC2 Run Command, which allows you to run any command on any of your EC2 instances that have the Systems Manager agent with an attached IAM role that allows access to Systems Manager. Choose Run Command under Systems Manager Services in the navigation pane of the EC2 console. Then choose Run a command. To install the Amazon Inspector agent, you will use an AWS managed and provided command document that downloads and installs the agent for you on the selected EC2 instance. Choose AmazonInspector-ManageAWSAgent. To choose the target EC2 instance where this command will be run, use the tag you previously assigned to your EC2 instance, Patch Group, with a value of Windows Servers. For this example, set the concurrent installations to 1 and tell Systems Manager to stop after 5 errors. Retain the default values for all other settings on the Run a command page and choose Run. Back on the Run Command page, you can see if the command that installed the Amazon Inspector agent executed successfully on all selected EC2 instances. Now that you have installed the Amazon Inspector agent, you will set up an SNS topic that will notify you of any findings after an Amazon Inspector run. 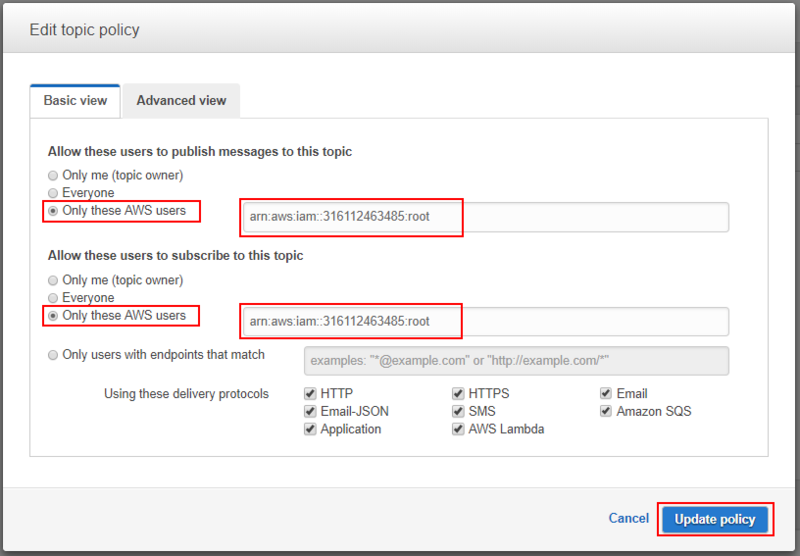 In the AWS Management Console, choose Simple Notification Service under Messaging in the Services menu. Choose Create topic, name your topic (only alphanumeric characters, hyphens, and underscores are allowed) and give it a display name to ensure you know what this topic does (I’ve named mine Inspector). Choose Create topic. To allow Amazon Inspector to publish messages to your new topic, choose Other topic actions and choose Edit topic policy. For Allow these users to publish messages to this topic and Allow these users to subscribe to this topic, choose Only these AWS users. Type the following ARN for the US East (N. Virginia) Region in which you are deploying the solution in this post: arn:aws:iam::316112463485:root. This is the ARN of Amazon Inspector itself. For the ARNs of Amazon Inspector in other AWS Regions, see Setting Up an SNS Topic for Amazon Inspector Notifications (Console). Amazon Resource Names (ARNs) uniquely identify AWS resources across all of AWS. To receive notifications from Amazon Inspector, subscribe to your new topic by choosing Create subscription and adding your email address. After confirming your subscription by clicking the link in the email, the topic should display your email address as a subscriber. Later, you will configure the Amazon Inspector template to publish to this topic. Now that you have set up the notification topic by which Amazon Inspector can notify you of findings, you can create an Amazon Inspector target and template. A target defines which EC2 instances are in scope for Amazon Inspector. A template defines which packages to run, for how long, and on which target. Navigate to the Amazon Inspector console and choose Get started. At the time of writing this blog post, Amazon Inspector is available in the US East (N. Virginia), US West (N. California), US West (Oregon), EU (Ireland), Asia Pacific (Mumbai), Asia Pacific (Seoul), Asia Pacific (Sydney), and Asia Pacific (Tokyo) Regions. For Amazon Inspector to be able to collect the necessary data from your EC2 instance, you must create an IAM service role for Amazon Inspector. Amazon Inspector can create this role for you if you choose Choose or create role and confirm the role creation by choosing Allow. Amazon Inspector also asks you to tag your EC2 instance and install the Amazon Inspector agent. You already performed these steps in Part 1 of this post, so you can proceed by choosing Next. To define the Amazon Inspector target, choose the previously used Patch Group tag with a Value of Windows Servers. This is the same tag that you used to define the targets for patching. Then choose Next. Now, define your Amazon Inspector template, and choose a name and the package you want to run. For this post, use the Common Vulnerabilities and Exposures package and choose the default duration of 1 hour. As you can see, the package has a version number, so always select the latest version of the rules package if multiple versions are available. Configure Amazon Inspector to publish to your SNS topic when findings are reported. You can also choose to receive a notification of a started run, a finished run, or changes in the state of a run. For this blog post, you want to receive notifications if there are any findings. To start, choose Assessment Templates from the Amazon Inspector console and choose your newly created Amazon Inspector assessment template. Choose the icon below SNS topics (see the following screenshot). A pop-up appears in which you can choose the previously created topic and the events about which you want SNS to notify you (choose Finding reported). 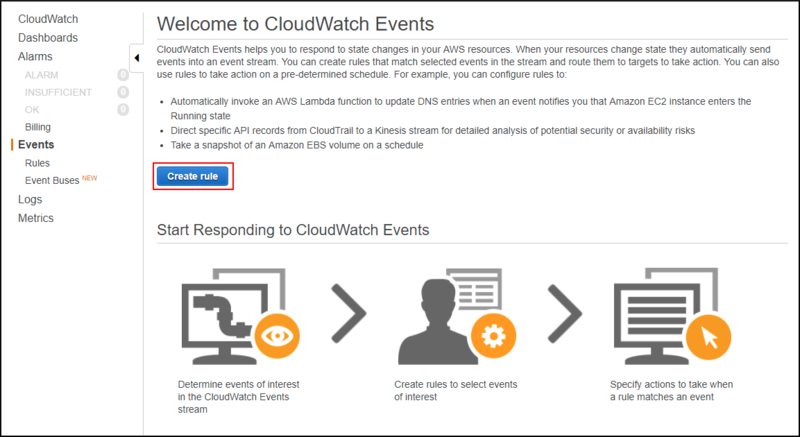 The last step in using Amazon Inspector to assess for CVEs is to schedule the Amazon Inspector template to run using Amazon CloudWatch Events. This will make sure that Amazon Inspector assesses your EC2 instance on a regular basis. To do this, you need the Amazon Inspector template ARN, which you can find under Assessment templates in the Amazon Inspector console. CloudWatch Events can run your Amazon Inspector assessment at an interval you define using a Cron-based schedule. Cron is a well-known scheduling agent that is widely used on UNIX-like operating systems and uses the following syntax for CloudWatch Events. All scheduled events use a UTC time zone, and the minimum precision for schedules is one minute. 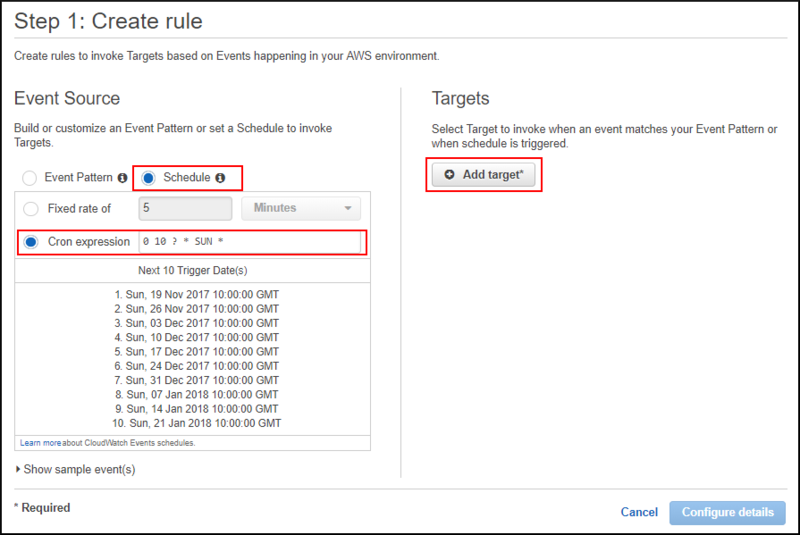 For more information about scheduling CloudWatch Events, see Schedule Expressions for Rules. Navigate to the CloudWatch console, choose Events, and choose Create rule. On the next page, specify if you want to invoke your rule based on an event pattern or a schedule. For this blog post, you will select a schedule based on a Cron expression. You can schedule the Amazon Inspector assessment any time you want using the Cron expression, or you can use the Cron expression I used in the following screenshot, which will run the Amazon Inspector assessment every Sunday at 10:00 P.M. GMT. Choose Add target and choose Inspector assessment template from the drop-down menu. Paste the ARN of the Amazon Inspector template you previously created in the Amazon Inspector console in the Assessment template box and choose Create a new role for this specific resource. This new role is necessary so that CloudWatch Events has the necessary permissions to start the Amazon Inspector assessment. 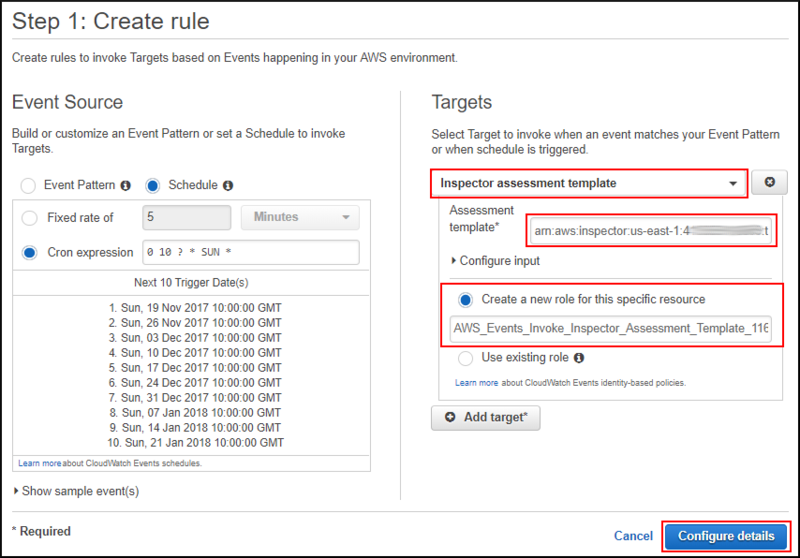 CloudWatch Events will automatically create the new role and grant the minimum set of permissions needed to run the Amazon Inspector assessment. To proceed, choose Configure details. Next, give your rule a name and a description. I suggest using a name that describes what the rule does, as shown in the following screenshot. Finish the wizard by choosing Create rule. The rule should appear in the Events – Rules section of the CloudWatch console. To confirm your CloudWatch Events rule works, wait for the next time your CloudWatch Events rule is scheduled to run. For testing purposes, you can choose your CloudWatch Events rule and choose Edit to change the schedule to run it sooner than scheduled. 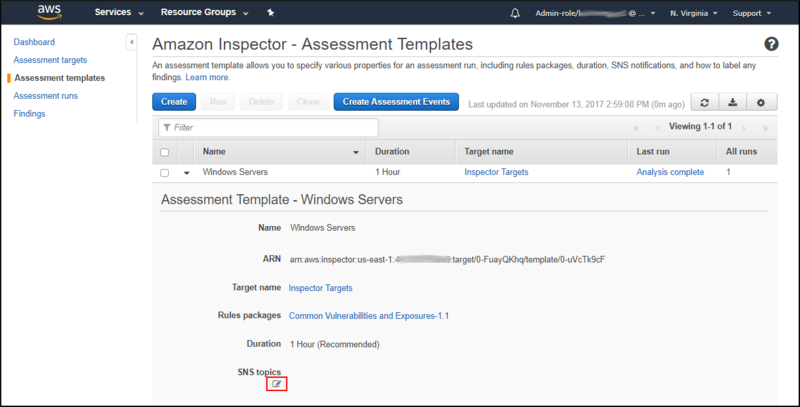 Now navigate to the Amazon Inspector console to confirm the launch of your first assessment run. The Start time column shows you the time each assessment started and the Status column the status of your assessment. In the following screenshot, you can see Amazon Inspector is busy Collecting data from the selected assessment targets. You have concluded the last step of this blog post by setting up a regular scan of your EC2 instance with Amazon Inspector and a notification that will let you know if your EC2 instance is vulnerable to any known CVEs. In a previous Security Blog post, Eric Fitzgerald explained How to Remediate Amazon Inspector Security Findings Automatically. Although that blog post is for Linux-based EC2 instances, the post shows that you can learn about Amazon Inspector findings in other ways than email alerts. In this two-part blog post, I showed how to make sure you keep your EC2 instances up to date with patching, how to back up your instances with snapshots, and how to monitor your instances for CVEs. Collectively these measures help to protect your instances against common attack vectors that attempt to exploit known vulnerabilities. In Part 1, I showed how to configure your EC2 instances to make it easy to use Systems Manager, EBS Snapshot Scheduler, and Amazon Inspector. I also showed how to use Systems Manager to schedule automatic patches to keep your instances current in a timely fashion. In Part 2, I showed you how to take regular snapshots of your data by using EBS Snapshot Scheduler and how to use Amazon Inspector to check if your EC2 instances running Microsoft Windows contain any common vulnerabilities and exposures (CVEs). If you have comments about today’s or yesterday’s post, submit them in the “Comments” section below. If you have questions about or issues implementing any part of this solution, start a new thread on the Amazon EC2 forum or the Amazon Inspector forum, or contact AWS Support.